In Southern Maryland, about thirty miles south of Washington, D.C., the Potomac River forms a shallow bulge called Mallows Bay. It’s an incredibly scenic place full of wildlife such as water fowl, heron and bald eagle. The adjacent land is a county park with hiking trails, picnic areas and a launch for small boats and paddle craft. But the central attraction of Mallows Bay is its so called "ghost fleet" consisting of the rotting and rusting remains of nearly 230 ships. The ghost fleet was part of an unprecedented shipbuilding program undertaken by the U.S. to assist its European allies during the First World War. When America entered the war, the allies had an acute shortage of vessels. Nearly half of all ships leaving for combat were getting sunk by German torpedoes. And not just military vessels; even merchant and passenger ships were targeted. In April of 1917, American President Woodrow Wilson set up an Emergency Fleet Corporation and ordered a thousand steamships to be built under a pressing deadline —the ships were to be readied in only 18 months. At once, a million men went to work cutting timber, expanding shipyards, laying rails and building machinery. It was a huge undertaking, and for a short time, the US became the largest shipbuilding nation. But no matter how hard they tried, the targets proved to be unrealistic, and by the time Germany surrendered, only a few hundred vessels were completed. None of them ever set sail, because it was discovered that the long transatlantic journey required so much coal that the ships could not carry much cargo. Besides, steamships were slowly becoming obsolete. 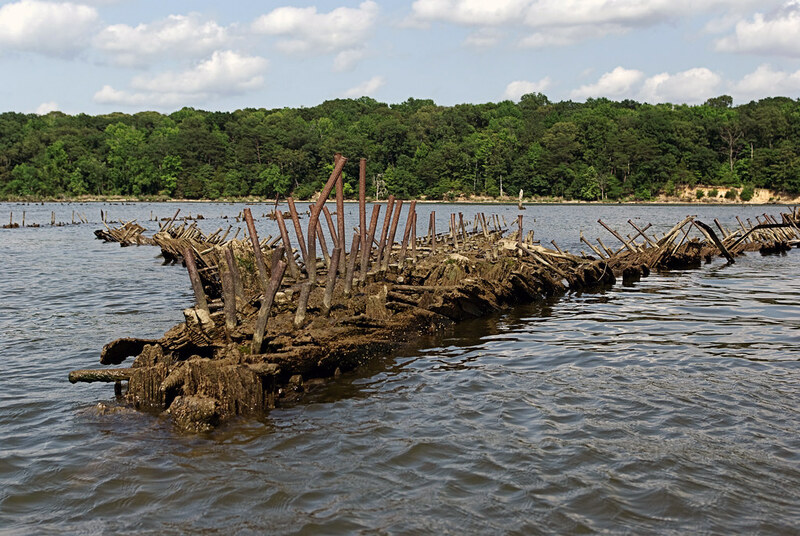 For a few years, the ships wallowed in the James River before the government sold them to the Western Marine & Salvage Company. The company towed the ships to Mallows Bay with the intention of scraping them for valuable parts and metals. But before they could do that, Western Marine went bankrupt. In the 1940s, another shipbuilder took over operations but the profits were so low that the ships were left behind again. Over the decades, the wrecks constituting what has been called the largest collection in the Western Hemisphere has been slowly reclaimed by nature, creating a new wetland ecosystem supporting diverse life forms. The hulls have sprouted trees and shrubs which now host fishes, turtles, otters, ospreys and eagles. 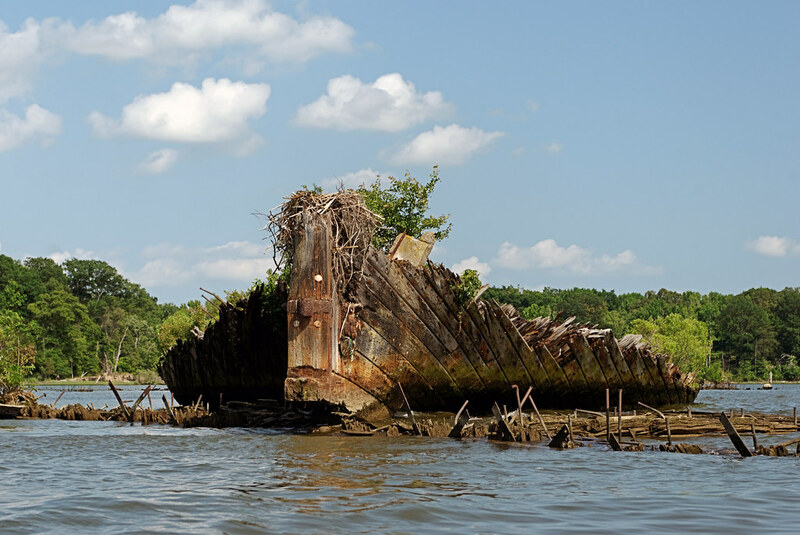 In 2015, Mallows Bay was declared a National Marine Sanctuary, and listed as an archaeological and historic district on the National Register of Historic Places. An enhanced satellite image of the wrecks in Mallows Bay.